New designer clothing label Marveli Clothing launch a spanking new website designed and configured by Easytech. The new brand has got off to a flying start with their first T-shirt collection already being a hit with professional footballers and international DJ’s. Their success has seen UFC martial artist Darren Till and Everton Footballer Ty Browning out and about wearing their products too! 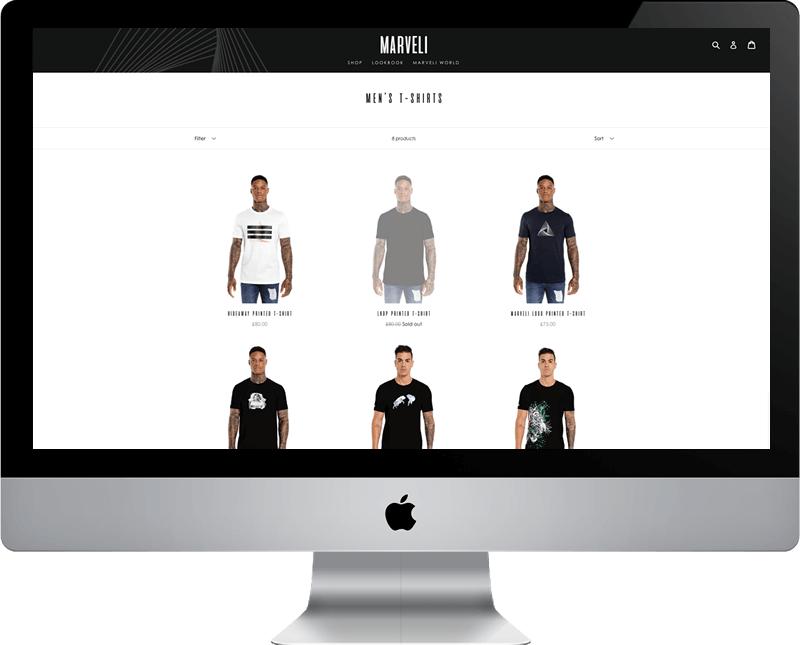 Our team got involved to help and advise on a eCommerce platform so Marveli Clothing could get started in world of online sales. With so many options available it was essential for the brand to understand what could be achieved when deciding on a web platform. We were able to demonstrate a few of the popular platform options such as WooCommerce, Shopify and BigCommerce. The team also discussed the need of using enterprise software such as Magento and the related costs needed to maintain each solution. And as its a hosted solution, Marveli can rest assured that its built into a safe environment, and technically sound. From a cost perspective, Shopify will allow the business to test the market and raise their brands visibility. Should they become the success we all believe they will; they can always reinvest at a later date. The Shopify platform allows you choose pre-built templates at a small cost, but many businesses require more ability to create custom templates. That is exactly what Marveli needed. Although, a lot of platform is closed off, but it does its own framework (liquid) that will allow us to add new features. We changed a lot of the styling to fit in with the customers brand and also introduced a custom carousel that would work work with another custom script that creates the mouse-scroll effect. The product page also required some customisation with a new product carousel which works great on mobile screens and prevents the visitor from having to click on thumbnails.